Cutting plate size: 3" x 6 1/4"
Thank you for stopping by on my blog today. 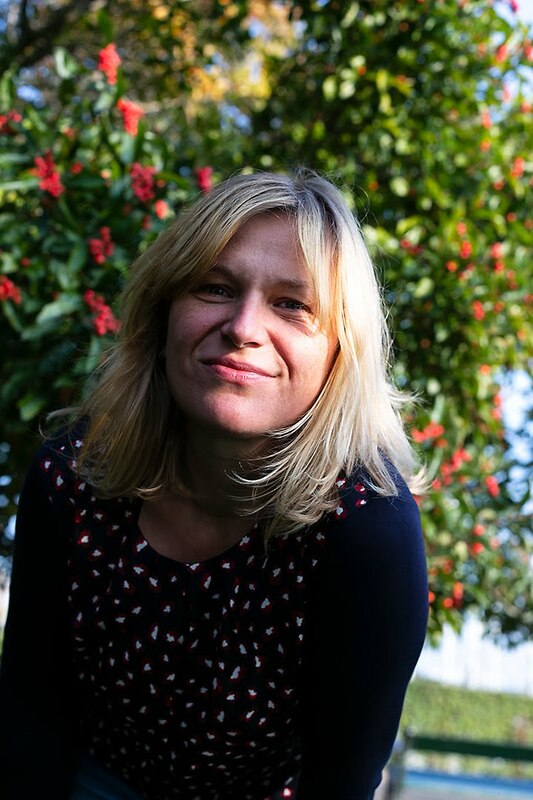 Next stop on our blog hop is over at Svitlana Shayevich. Have a wonderful day, yours Sandra. Thanks for more inspiration! Beautiful! Such a pretty layout and loving this mini machine! I love all the different techniques on your layout! The wood veneers, Black & white images with beautifully colored images, multiple patterns and all the little details! True perfection! I 💖💝💖💝💖💝💖the Blossom machine! Can’t wait to get my hands on it! TFS! 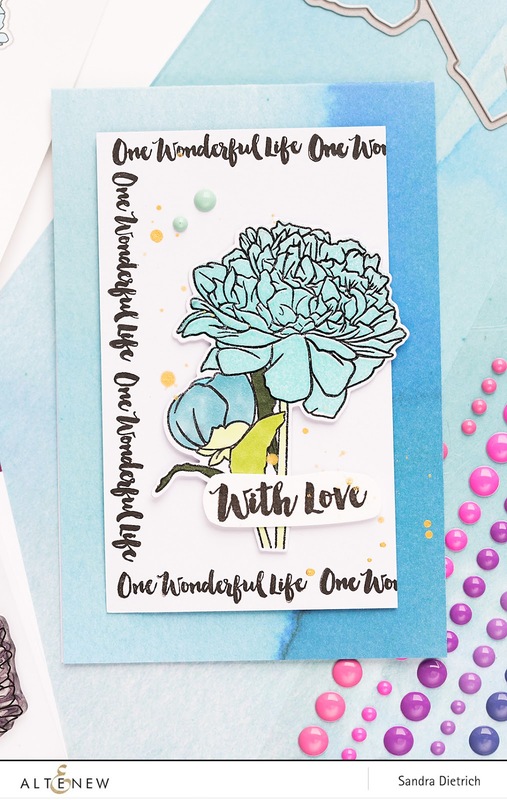 I love the blue flowers on the with love card. Such a pretty color. Love your layout and the card is beautiful, too. The mini die cutter is so cute! 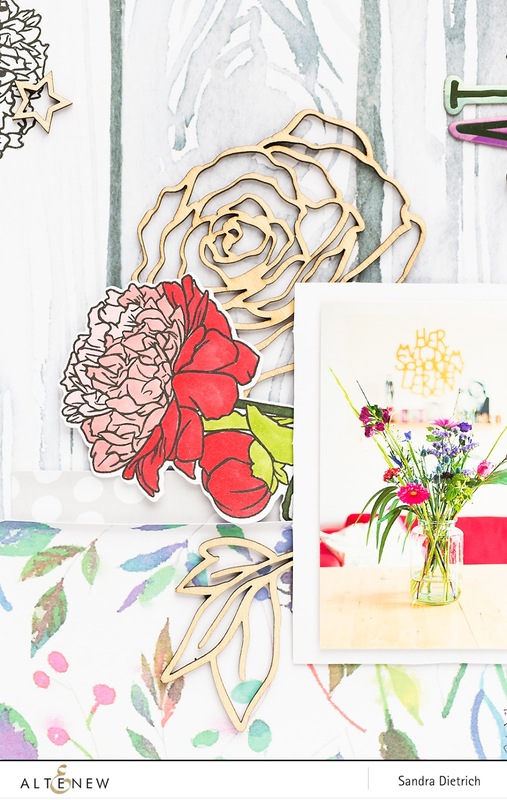 Beautiful projects and I love the mini die cutting machine. Beautiful creations! I really like this entire release. Beautiful work! Love this wonderful release. Gorgeous cards! Love you colors and layouts! Your projects are stunning!! I love the designs of each one!! Lovely cards, thank you for sharing your creativity. 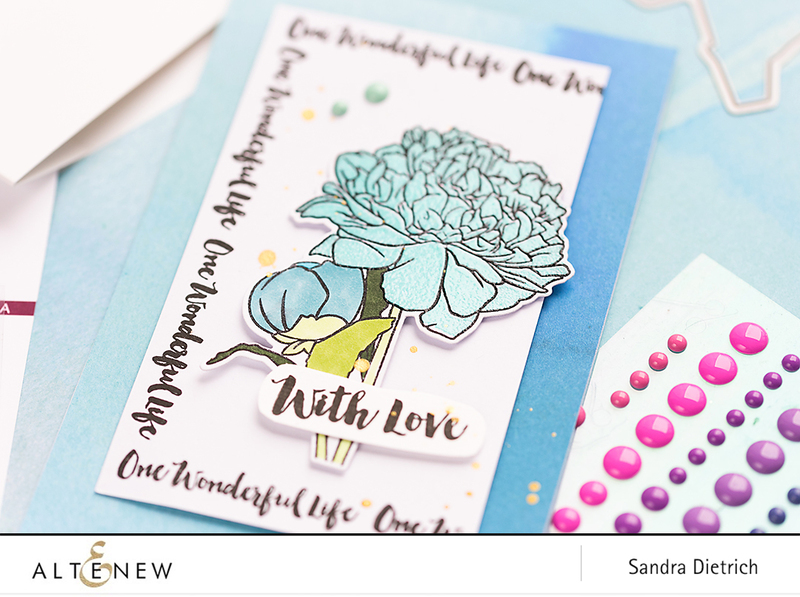 wonderful layouts, Sandra - and that little die machine is on the top of my wish list!! Love the blues!! Gorgeous cards. 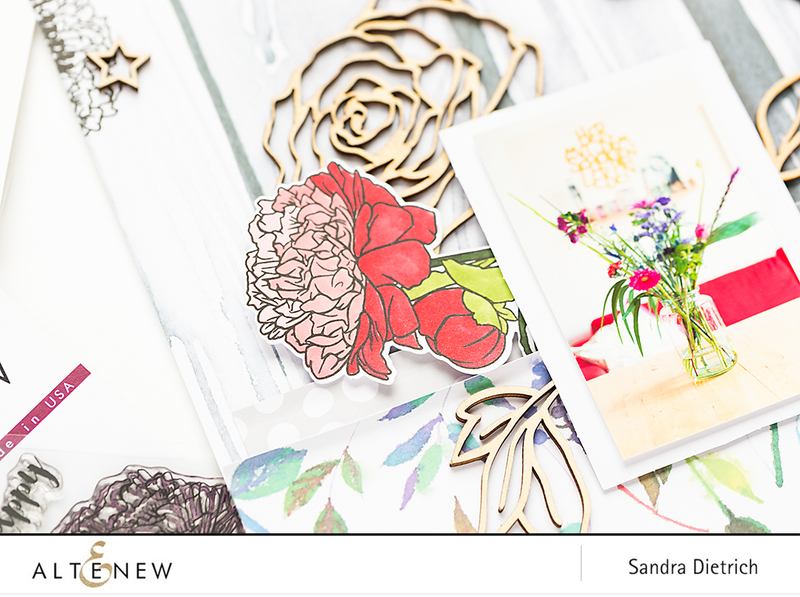 Lovely photo, layout and card! Awesome stamp sets! 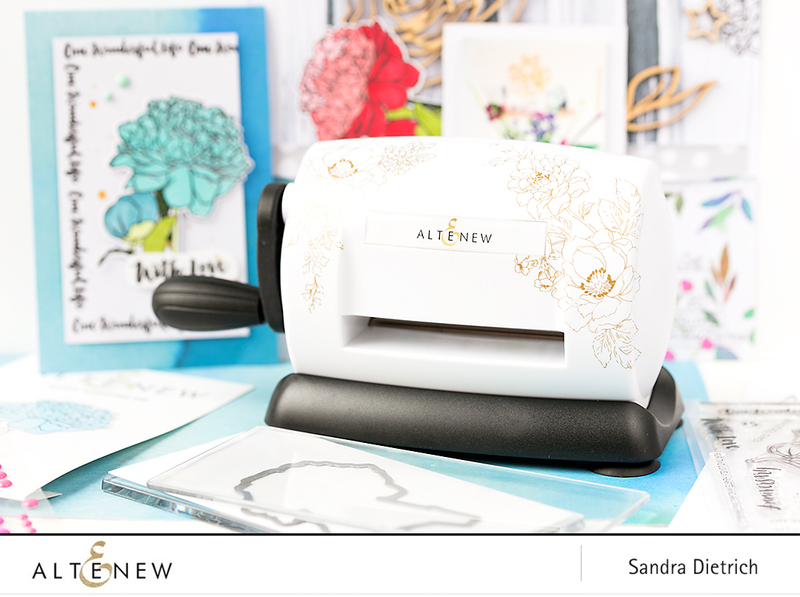 Love the beautiful flowers and excited about the mini die cut machine! Very pretty! Love the colours. 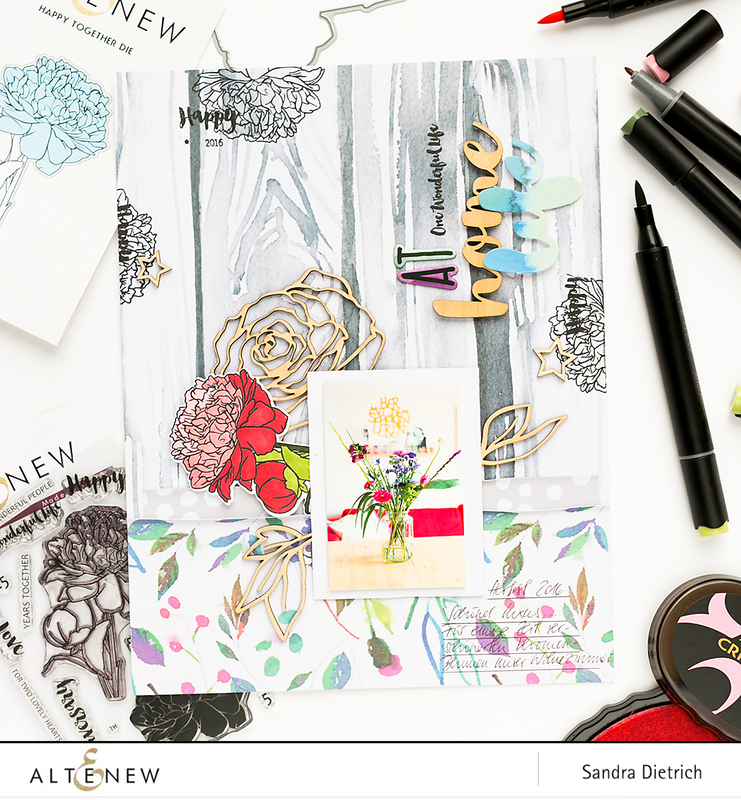 They are both fabulous.. love the card and the layout cheerful and pretty. Beautiful cards and adorable machine! Love these cards, so very beautiful. 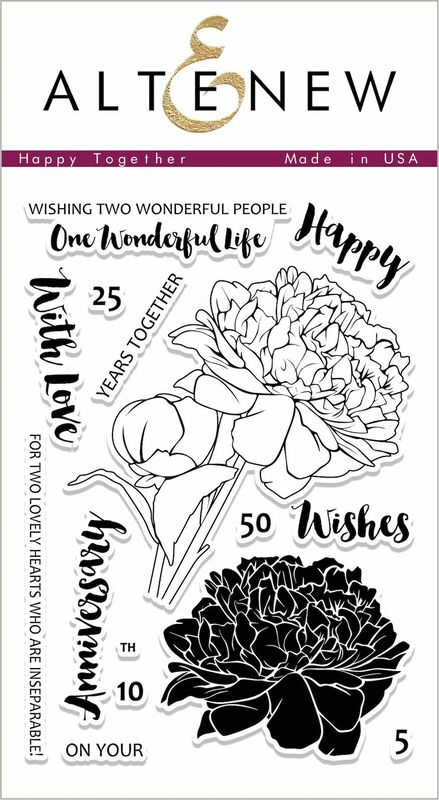 Love your card -it is stunning! Gorgeous creations! I especially love your card! Great release! Wow!! 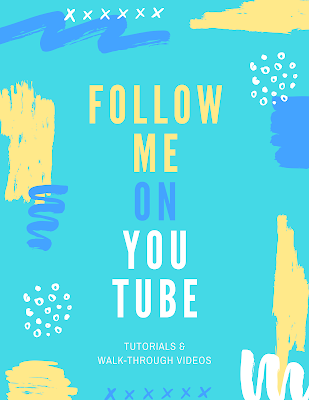 All wonderful projects!! 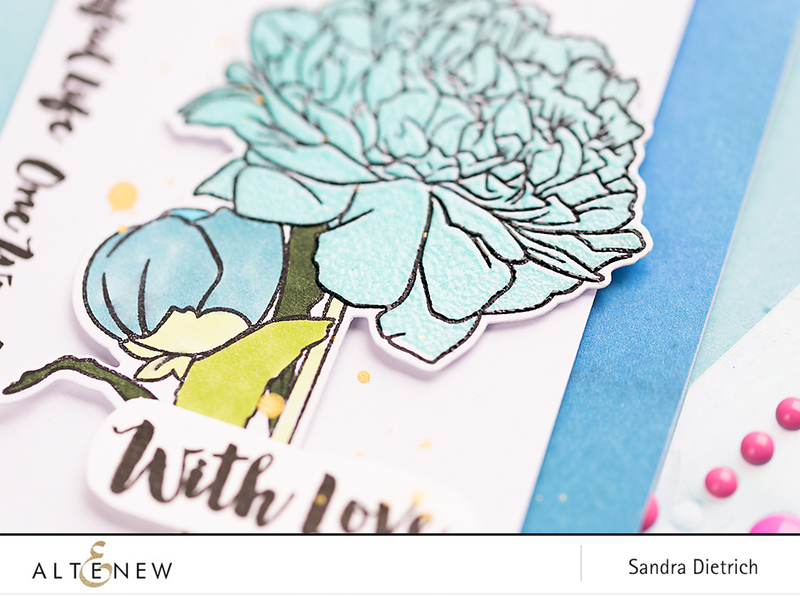 I love how on your blue peony card you used the sentiment to frame it!! Very cool looking!! Great use of the new machine. Thanks for the lovely examples! Beautiful page and card, lovely! Great card and layout! Thank You for sharing. Beautiful project and great release. 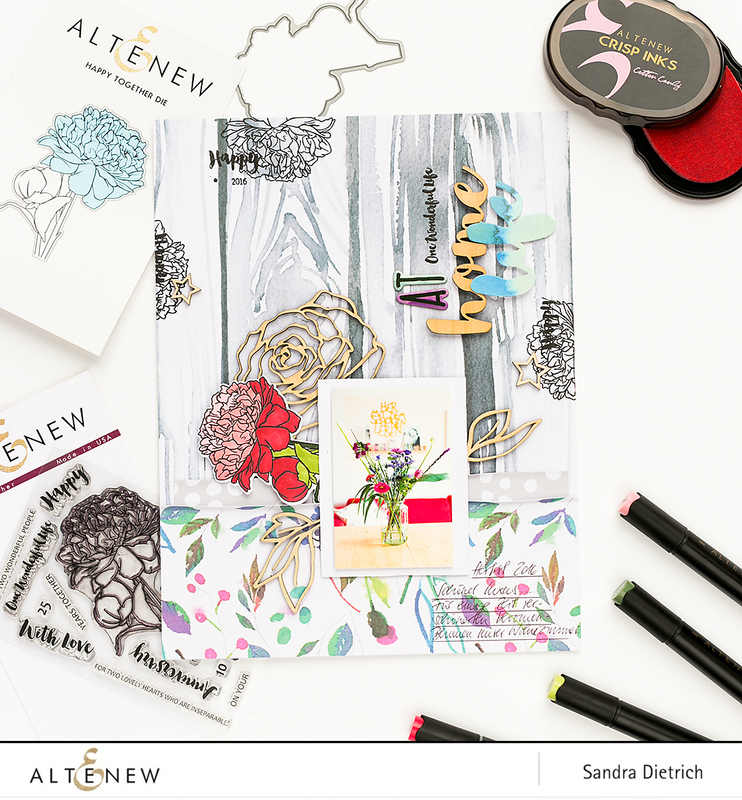 Beautiful layout and card! Love the colors! 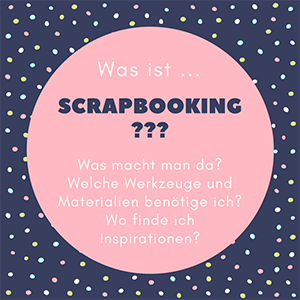 Love the variation of images on your page, with floral patterned paper at the bottom against the vertical woodgrain at the top and the wood embellishments. Gorgeous! 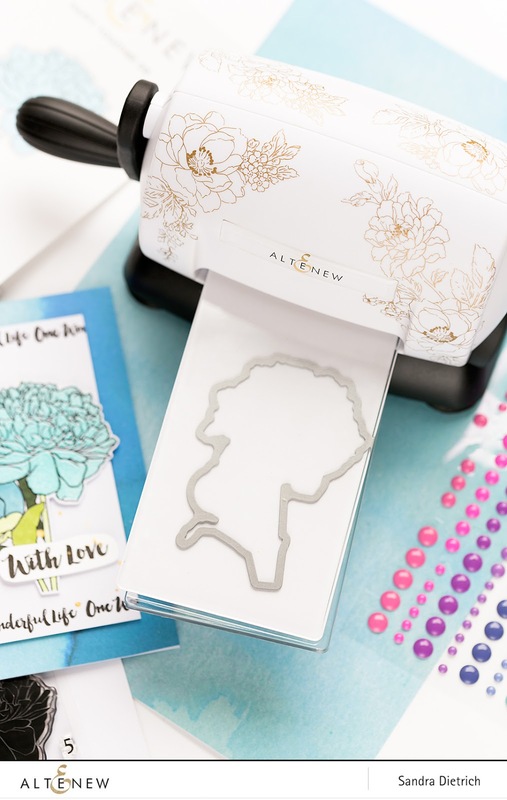 Your layout turned out beautifully...I love the sentiments included with that stamp set. I can see how that tiny die cut machine could fit nicely on my desk, too! Love them all. Will have to check out the new die cut machine. Your project shows off your artsy talents! Such a bright and beautiful layout! Love the mix of colors and patterns! 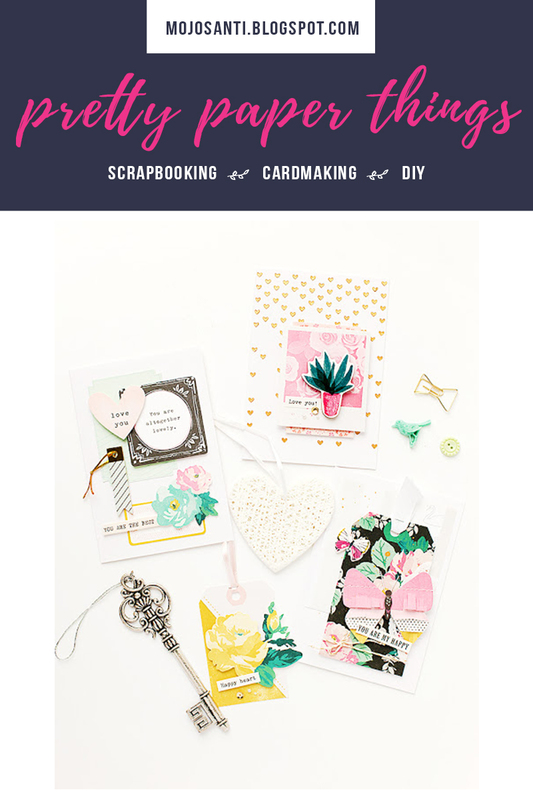 Your card & layout are both so beautiful and show off your wonderful creativity! 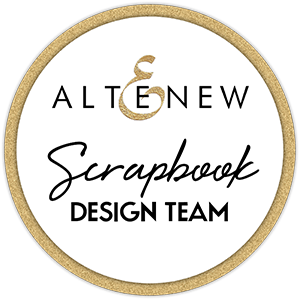 Also love this new Altenew December Release! Beautiful card -- I love the blue flowers. What a nice change to frame it up with a sentiment!! So colorful, very nice card! Beautiful layout, the wood veneers are adorable. Love the colour palette used on your card. Thanks for the inspiration. Wow! Awesome cards.Love the new release! Love your color combinations! Well done! Beautiful color combinations! Well done!